Spa Electrics' range of outdoor pool lighting transformers are designed to meet Australian standards and purpose built for our lighting products. 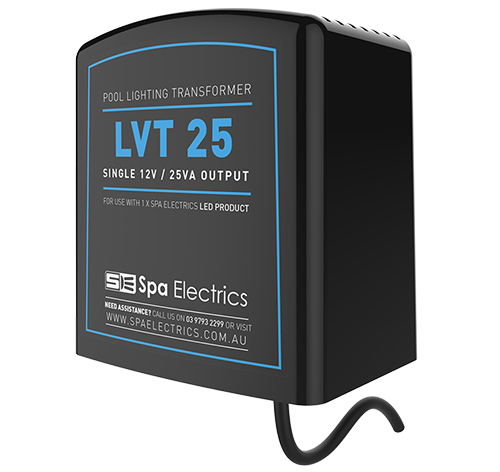 By installing a Spa Electrics transformer, you can rest assured that your pool not only meets Australian Standards, but that each transformer is designed specifically for use with your Spa electrics lighting products. All our transformers use robust Toroidal coils for long term reliability and a clean power supply. They are designed for Australian installation conditions and feature a standard GPO plug in connection for simple installation. Our dual transformers can operate up to 2 Spa Electrics Pool Lights and feature a GPO outlet to a allow daisy chain connection for multiple light fittings. Lowering installation costs and ensuring synchronised operation across multiple lights.